Definition at line 19 of file CCompartmentGraphNode.h. Definition at line 31 of file CCompartmentGraphNode.cpp. 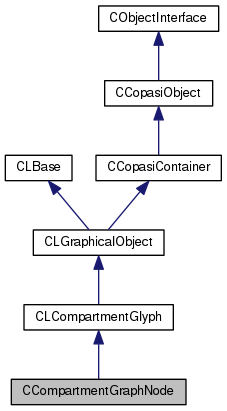 Definition at line 15 of file CCompartmentGraphNode.cpp. Definition at line 23 of file CCompartmentGraphNode.cpp. References CLGraphicalObject::getKey(), CLGraphicalObject::getModelObjectKey(), mObjectKey, and mOrigNodeKey. Definition at line 35 of file CCompartmentGraphNode.h. Definition at line 38 of file CCompartmentGraphNode.h. Definition at line 36 of file CCompartmentGraphNode.h. Definition at line 39 of file CCompartmentGraphNode.cpp. Definition at line 23 of file CCompartmentGraphNode.h. Referenced by CCompartmentGraphNode(), getObjectKey(), operator<<(), and setObjectKey(). Definition at line 22 of file CCompartmentGraphNode.h. Referenced by CCompartmentGraphNode(), getOrigNodeKey(), and operator<<().